REUTERS/Larry RubensteinU.S. 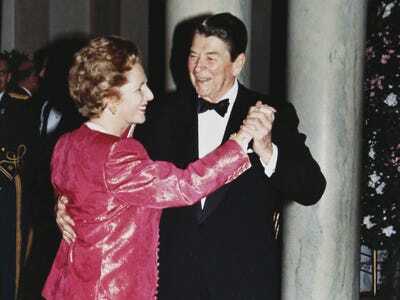 President Ronald Reagan and Britain’s Prime Minister Margaret Thatcher dance in the foyer of the White House during a State Dinner in Thatcher’s honour in this file photo taken on November 16, 1988, in Washington. 1. A powerful militant group in Egypt, Ansar Beit al-Maqdis, has pledged its loyalty to the Islamic State, an alliance that could provide the Egyptian group with new money and weapons to fight the Egyptian military. 2. Reports indicate that the leader of ISIS, Abu Bakr al-Baghdadi, may have been killed or injured by US-led airstrikes in the Iraq city of Mosul, although it has not been confirmed by the US military. 3. South Korea has ended the search for nine bodies still missing from April’s ferry disaster that killed more than 300 people. 5. Catalan leader Artur Mas said he would push for a binding independence vote after preliminary results from Sunday’s symbolic referendum showed that 85% of voters supported breaking away from Spain. 6. Tuesday marks Singles Day in China, the world’s largest online shopping day of the year and the country’s anti-Valentine’s Day. 7. Google is helping to fight Ebola by donating $US2 for every dollar raised through its website. 8. Oklahoma oil magnate Harold Hamm must pay his ex-wife close to $US1 billion in the most expensive divorce in US history. 9. An Iranian copy of a US drone captured in 2011 has taken its first flight. 10. A river of lava that has been creeping toward a Hawaiian town for months burned down the first home. An extremely rare metal, reidite, was found in a 450-million-year-old crater in Wisconsin.